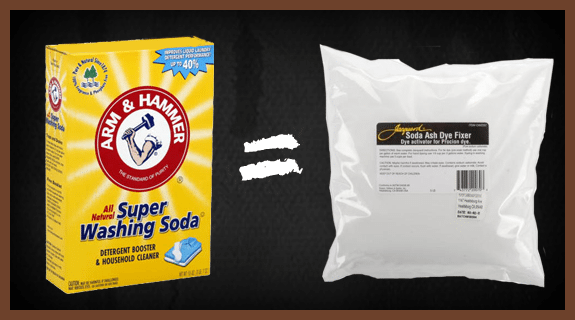 One of the ingredients in our homemade detergent for both standard and HE washers (get the recipe HERE), Super Washing Soda is not always easy to find. And when you can find it, it’s pricey—$5.50 for a 55-oz. box is typical. You can stop looking for it. Super Washing Soda is a brand name for sodium carbonate (which is NOT edible and should NOT to be confused with sodium bicarbonate, which is baking soda). But hang on, it gets even more confusing: Sodium carbonate goes by another name as well: soda ash. It’s annoying that it has two generic names until you discover when purchased as soda ash, it is much cheaper. Soda ash is used in swimming pools to keep the pH balance in check. It is also used in the textile industry to “fix” dyes. It comes in quantities from one to hundreds of pounds. It looks, smells and feels just like Super Washing Soda because (ready?) it’s the same thing! Look for soda ash as you get ready to make our homemade laundry detergent, which is fabulous and costs only about a nickel per load when you make it yourself. Made popular by its late-night infomercials, basic OxiClean is a not a laundry detergent but rather a non-chlorine bleach. It releases oxygen to remove stains, which is evident by the bubbles it makes as the white powder hits the water. The active ingredient in OxiClean is a generic white powder substance called sodium percarbonate. 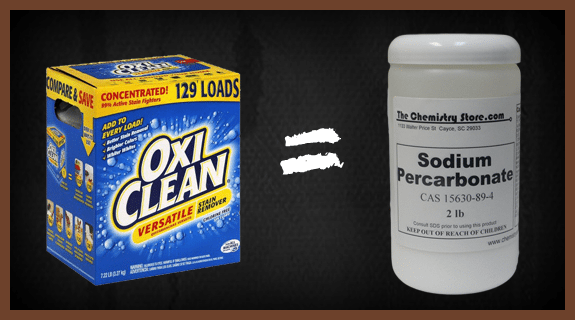 Generic sodium percarbonate is not diluted, unlike OxiClean, which is only about half sodium percarbonate with the balance filled made up of soda ash (see above) and inert fillers. Since sodium percarbonate is highly concentrated, where you would use 1/2 cup of OxiClean in your laundry, you would substitute with only 2 tablespoons of its generic, sodium percarbonate. Sodium percarbonate is really cool stuff. It is a highly concentrated powder that releases hydrogen peroxide. It is easy to use for cleaning, stain removal, and laundry. Mixing it with water activates it. Sodium percarbonate has a long shelf life as long as it remains dry. Sodium percarbonate is best when used with HOT water—such as mixed into the cleaning solution in a carpet cleaning machine. It is great for cleaning and disinfecting things like the cat box, the birdbath, bedpans. Mix sodium percarbonate in hot water, fill your (empty) cat box or birdbath or bedpan and give it time to soak. Just like hydrogen peroxide, sodium percarbonate needs to have time to do its work. Two tablespoons are sufficient to clean a whole cat box (filled with water), or a whole birdbath (filled with water). Just make sure you use HOT water. Mix sodium percarbonate into a thick paste to use on light colored tile grout. Let it sit and it will bleach out any stains. If you think of sodium percarbonate as an alternative form of hydrogen peroxide, that pretty much covers it. You can safely use it for most of what hydrogen peroxide is used for, bearing in mind it is a very concentrated powder. You may be tempted to use too much sodium percarbonate! 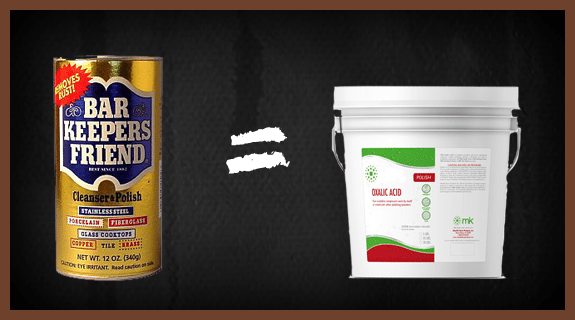 It’s easy to sprinkle some on a stain and scrub it in when a much less concentrated form would likely do the trick. Go easy and you’ll be happy with the results. Bonus: Sodium percarbonate the product you want handy if you need to remove the orange mystery stains left by avobenzone, which is the active ingredient in nearly every sunscreen product. Just make sure you treat that stain before it goes into the clothes dryer, which will set it for all eternity. All three generics—oxalic acid, soda ash, and sodium percarbonate—are available to the public for purchase. Click on the linked words to order them online. Or if available in your area, check your local pool supply and janitorial supply stores. CAUTION: Always test something new in an inconspicuous place first. Always. And read and heed the caution messages on any product before proceeding. Always wear protective gloves and eyewear when using cleaning chemicals. WARNING: We have not tested every formulation that we list. This list is strictly for informational purposes and a guideline to various detergent, cosmetic and coating formulations. This information is provided without warranty of any kind or fitness for a particular use or purpose. You are encouraged to conduct your own tests. Read all labels and MSDS Sheets.